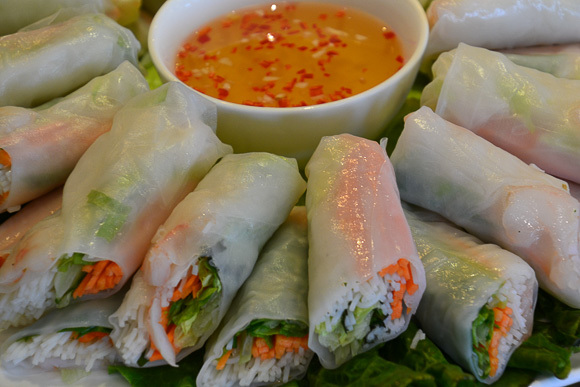 For many travelers, enjoying local food is a key ingredient to a great trip. 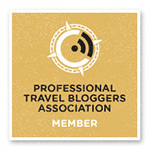 Not surprisingly, this is one of the most asked about topics when I talk to people about my trip to China with Viking River. 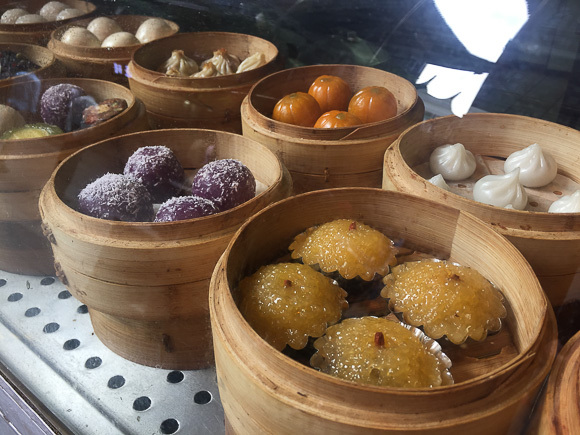 Culinary tourism has exploded in recent years and there is no denying the connection between the pleasure of eating and learning about a country’s customs or connecting over a meal. I like to scratch beneath the surface of a culture by visiting markets, tasting what’s grown in the region and breaking bread, or in this case dumplings, with a local resident. You can not talk about Chinese food without bringing in the cultural tradition of the Five Elements: Wood, Fire, Earth, Metal, and Water, the five basic aspects of Qi, or life energy. In addition to the medicinal connection, music, art, climate, direction, timing, and spiritual systems all follow this theory and need to be in balance to function properly. Five spice powder gets its name from the five elements, not because it contains five spices as many believe. 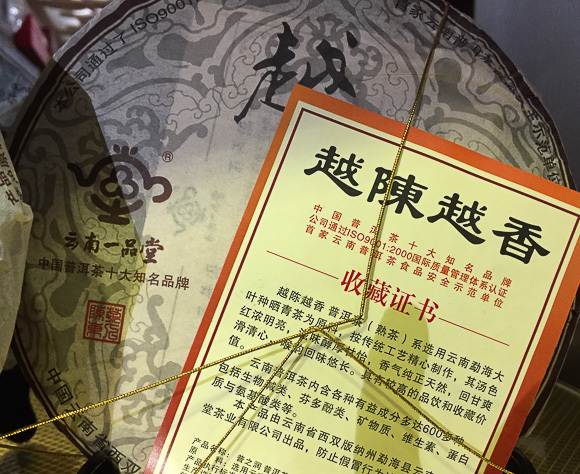 According to traditional Chinese medicine, the five elements are manifested in different parts of the body and if there are imbalances in these elements, disease can result. The liver, kidney, heart, lung and spleen represent the five host points for wellness. For thousands of years, different herbs and spices have been used to bring balance to these pressure point. That is how five-spice powder came to be. Yes, there were some weird eating opportunities, as there always are when traveling to an exotic destination. 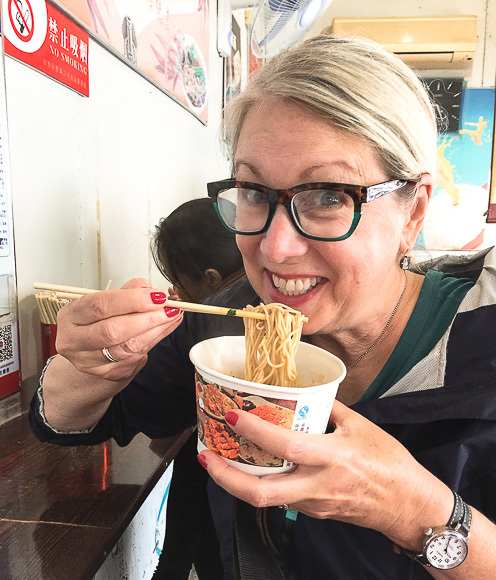 While I love street food, I am somewhat cautious about food safety, and there are certain rules I try and follow for safely eating street food. 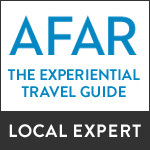 Eating local is a tenant of responsible travel. 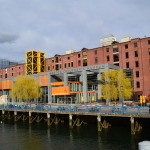 The concept puts you in sync with the culture, helps foster understanding and most of all works toward making travel sustainable in the region. 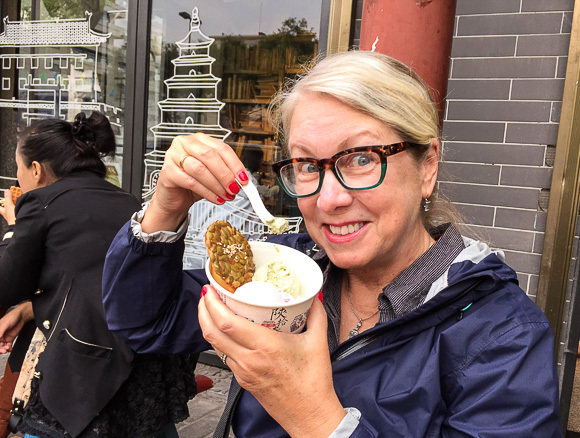 Let’s get started with the dishes that stood out and flavors I found most compelling when tasting China with Viking Cruises on their Imperial Jewels of China itinerary. The origin of congee is up for debate; everyone agrees that this dish of rice porridge was used during famine and as a way to stretch a meal when there was not enough to go around. 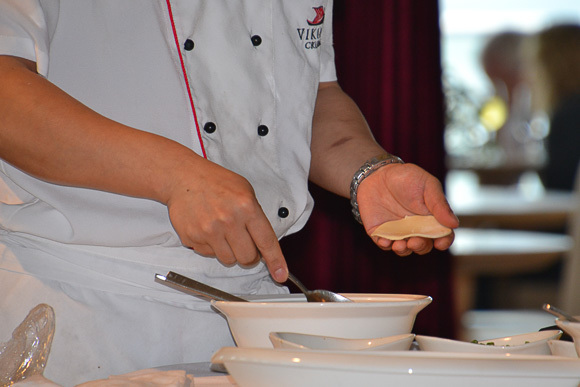 Besides being an every day staple, congee was used as food therapy for unwell and upset stomachs. The breakfast of champions. I tried, I conquered, and I liked it best when eaten with a chocolate croissant. So much for me starting out native. 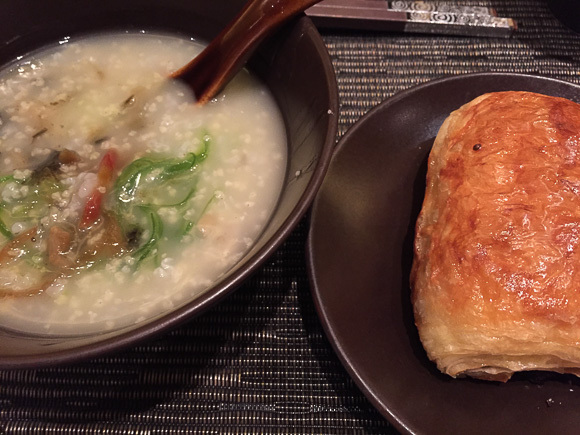 Similar to a loose oatmeal, congee is eaten for breakfast throughout China and many Asian countries. Made usually from rice, I think it’s legitimate to call it gruel. Often served with side dishes and “add ins” the variety can be many, and it is a meal on it’s own when meat, fish and other flavorings are part of the ingredients. Bland and comforting in a chicken soup sort of a way, if I’m going to have fish for breakfast, I have to admit I liked mohinga, the traditional breakfast soup of Myanmar much better. An interesting aside about congee: Sections of the Great Wall, built by workers of the Ming dynasty in the 1300’s, were held together by a mortar substance that included a paste of sticky rice flour and slaked lime. It was so effective and created such a strong bond, that in many places weeds are still not able to penetrate the joints. Chinese food of yesteryear was a much different cuisine then what we would expect today. Sichuan pepper, an indigenous plant has a unique aroma and flavor and is not hot or pungent like black or white pepper. The introduction of chili peppers to Asia was most likely a result of trade with the Portuguese and probably did not take place until the 15th century. Much debate surrounds this key ingredients, and everyone agrees the trajectory of its arrival is complicated. 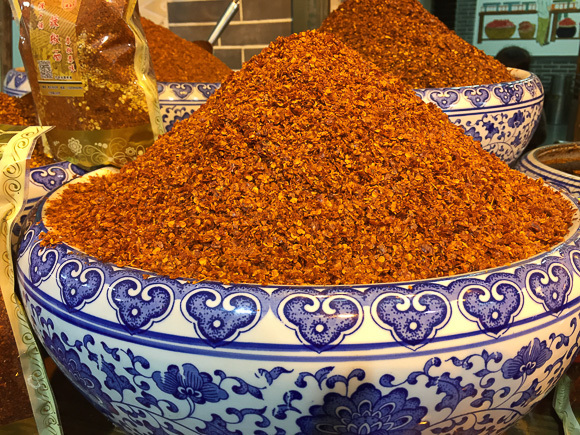 One thing everyone will agree on however: the people of Sichuan and Chongqing are now known for their obsession with the hot pepper. The food of both regions is synonymous with spicy. Since we embarked on our cruise along the Yangtze in China with Viking River at the port of Chongqing, I dug deeper there. Chongqing was selected as the secondary Chinese capital during the Second Sino-Japanese War (1937-1945). People migrated to this southwest area in droves and resources became tight. 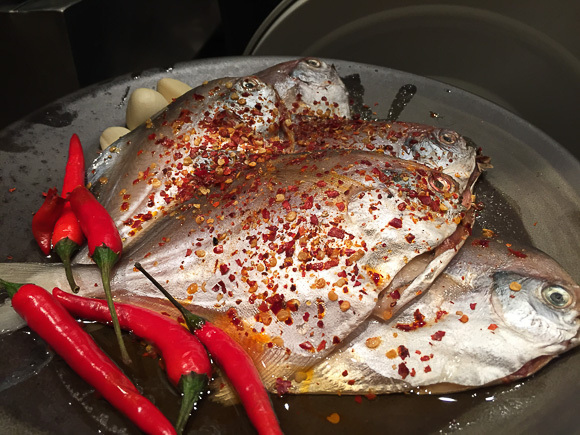 The hot-pot style cooking of the labor class, often the result of boat dwellers pooling resources and cooking in a single pot, was flavored with large quantities of hot pepper. Ingredients during war time became more scarce and dishes of the upper class that had previously resisted the use of chili peppers started to combine them into their cooking. When the war ended, citizens went back to their villages and high ranking officials brought these new flavors with them. Sichuan spice spread as did the use of the chilis. While the amount of heat varies greatly in the country, spicy food had found a home on new tables throughout the provinces. 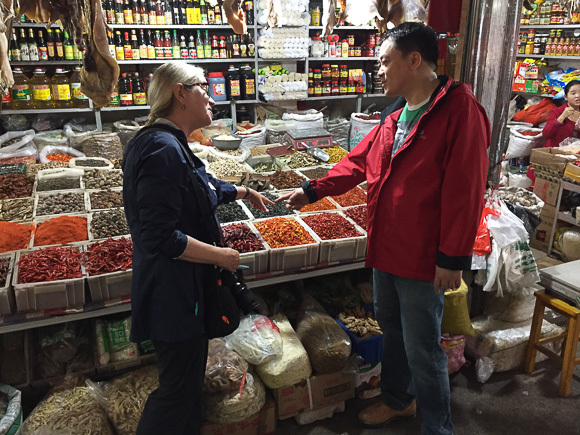 A highlight of the cruise was taking a private market tour with Danny Tang, the head chef on the Viking Emerald. Danny has worked for Viking for 10 years, and his personal tastes run more towards the food of his Shanghai hometown, a less spicy cuisine than what is found in Chongqing or Sichuan.This was an exciting opportunity to see an authentic China and visit a market where few tourists would go. In fact, I was one of the two Western people there. Sharing his favorite noodle shop on the way back to the ship, he warned about a cautious addition of chili. If your eyes water, it’s hot enough. So delicious, and as you can see from the steam on my glasses, a spicy success! The pomegranate has been mentioned in the earliest of recorded history. Chinese mythology has the fruit used in both religious ceremonies as a powerful symbol of fertility. Did the seeds represent the number of generations a family would see or the number of sons to be born? Regarded as a good luck charm, it was often sprinkled on the limbs of a tree during ceremonies. The colorful and slightly tart seeds were used to create hair dyes and for medicinal purposes. Today many claim it is a potent antioxidant. 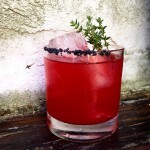 I have been using the pomegranate for years and love to add it’s deep ruby juice to seltzer for a refreshing spritzer. 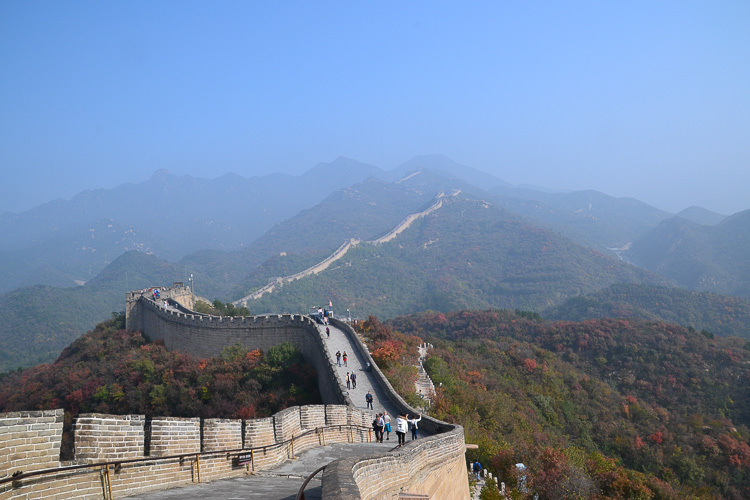 When I saw how abundant it was during the trip to China with Viking River, I could not believe my eyes. Branches of orchards were heavy with fruit ripe for harvest. The seeds were being squeezed for juice in every marketplace we visited. The hip gelato and coffee shop used the flavor to my delight. Tea is at the very heart of Chinese culture and there is no better way to experience the tradition then a tea ceremony. The process has been handed down for centuries and goes many levels higher then our simple tea bag in hot water. Legend has it that tea was discovered over 5000 years ago when an emperor, in the expanse of his kingdom, had water boiled for purity. Tea leaves were accidentally mixed in, and the rest, as they say, is history. Ever since then, teas have been used as a ritual for healing and spirituality. Over time, monks adopted the process as a way to introduce respect for nature and an overall sense of calm. Hefty claims, yes, but there is no denying the calming nature of an afternoon cup in a quiet space. The tea house evolved as a place where people could mingle freely regardless of social status. To allow guests to fully experience their destinations, Viking offers optional excursions. 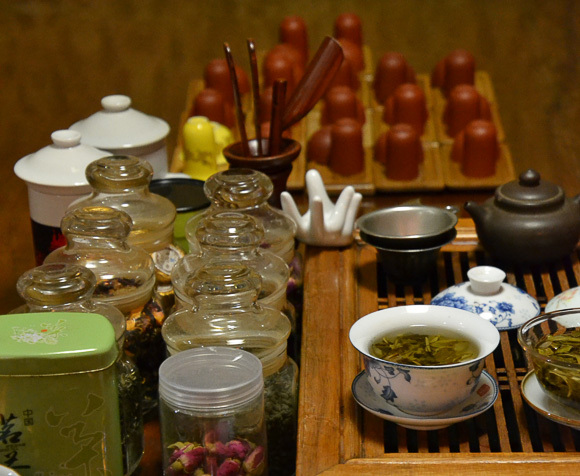 Taking part in a tea ceremony provides greater understanding of how tea is woven into the fabric of Chinese life. Much like wine tasting, the nuances between flavors are best explored with an expert. Adjacent to the tea rooms is a tea shop, where some of the blends can fetch hundreds of dollars. I managed to bring home quite a few of the blooming flower tea pods as gifts. Dumplings have been eaten by the Chinese for an incredible 6,000 years. Culinary schools specialize in their recipes and the variety is endless. Fillings are usually a minced pork filled with spices, but I had no problem finding shrimp and vegetable varieties. In addition, there are the sweet varieties. This dumpling guide from Lucky Peach breaks it all down for you. The skin is usually made simply from flour and water rolled into a very fine layer. 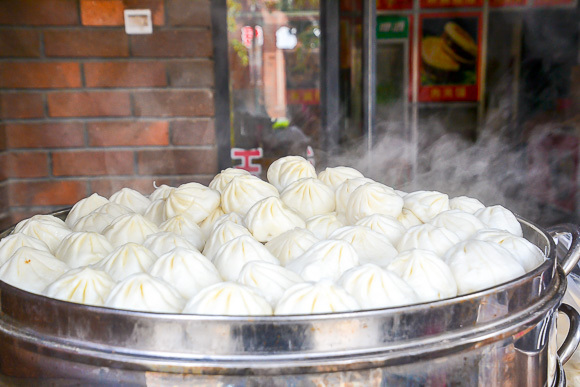 The dumplings are then cooked in a frying pan or steamer. Cabbage, chives, spring onions 5 spice, ginger, and garlic, sesame oil, spices and slat are usually part of the equation. On the ship we had a dumpling lesson demonstrating how a spoonful of the mixture is wrapped by hand into a pinched shape with tiny folds. I love the shape with all that pleating I think as much as the flavor. Dessert varieties are often made with a bean paste. Even though not all of the above are dumplings, I just love the way they are presented in the steamer baskets. The joys of eating with your eyes. 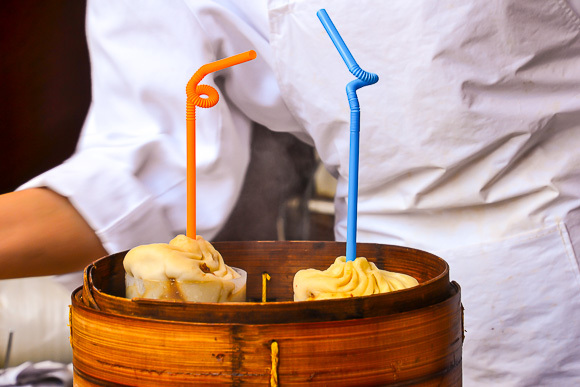 Soup dumplings are brought to the customer with a straw-brilliant! I can’t tell you how many times I’ve seen a diner bite into one in Boston and send scalding liquid down the front of their shirt. It takes days to get your taste buds back after you’ve scorched them. You can find dumplings on the street and in the markets. They are probably one of the most ubiquitous foods I saw. The dipping sauce, a key accoutrement, is a combination of soy, vinegar and chili oil. Simple salty, sweet and sour balance of flavors. Tofu is known as vegetable meat in China and is said to have been invented by a Chinese scholar during the Western Han dynasty (206BC-AD 24). Searching for the gift of immortality and a magic elixir, he created the white and tender material from soybeans. Although his efforts did not produce the fountain of youth, the local peasants found the giggling blocks delicious. It is now fashioned into cakes, loaves and candy. Extremely versatile, you can find it shredded, sliced, deep fried, steamed, smoked, marinated, and fermented into a variety of products throughout the world. 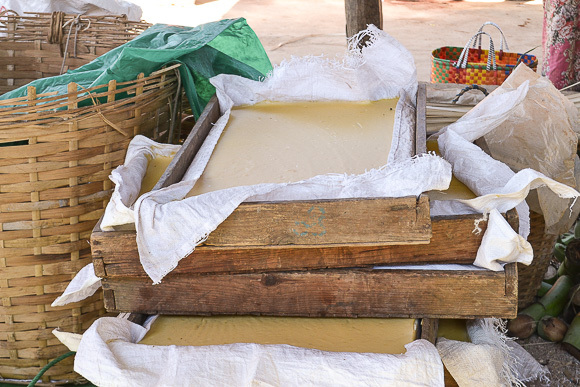 Freshly made tofu ready to be cut and weighed. Tofu contains little fat and is high in protein, calcium and iron. The product has very little taste or smell, but has the ability to absorb new flavors through spices and marinades. This quality, combined with the excellent nutritional value, makes it easy to see why tofu has become a staple of Asian cuisines since ancient times. Although I only buy organic and non GMO when using it at home, some rules have to shift when you travel. 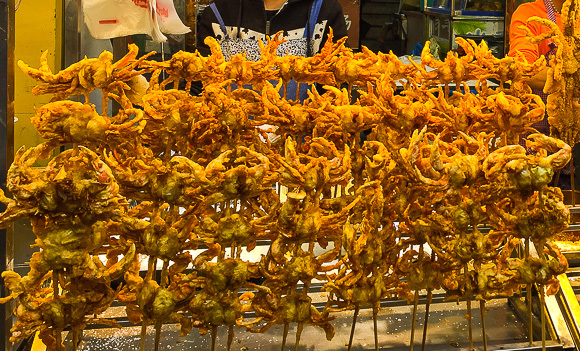 High in protein, low in fat and cholesterol, I was on the hunt for a taste when I visited the Muslim Market in Xi’an. The women selling the spicy dish at one shop could barely keep up with demand. 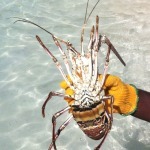 Once we got on board the ship, it was a daily dish at the lunch buffet. Noodles are arguably the most popular food in China. History indicates they have been consumed here since 2000 B.C. A bowl of preserved noodles found on the site of the Yellow river confirms they were made of millet and stretched by hand. Children are taught how to stretch dough into noodles at school and noodlemakers can make dozens of shapes ranging from “silk hair” to triangular. There are more than 2,000 manufacturers of instant noodles and more than 100 different varieties of fresh. Noodles are cheap, nutritious, and convenient. More than 50 percent of the wheat consumption in the region is used in noodles. The general eating technique seems to slurp and guide with chopsticks along the way. 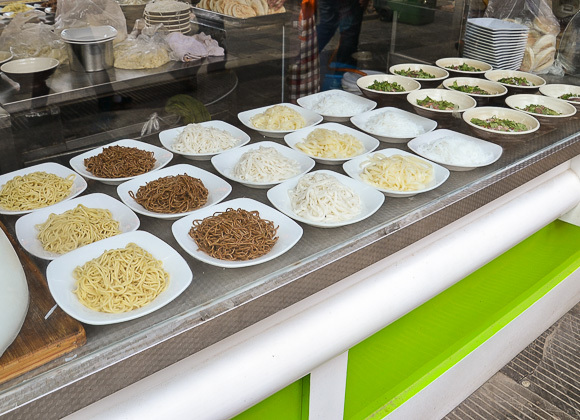 Unlike European pasta, which is usually pressed out of a machine, Chinese noodles are kneaded, and then stretched and pulled into thin threads or rolled or sliced into flat ribbons. Watching a noodle maker at work outside the Terra Cotta Warriors, I saw in the space of a few minutes her take the rope of dough and quadruple it in length. Each pass doubled the measurement twice as far as she could reach. It was mesmerizing to observe her skill, stretching what appeared as a weightless string. Chinese vegetables come in a variety of intriguing shapes, sizes and textures from fuzzy melon to the tender young shoots of the bamboo plant such as Chinese cabbage, bok choy, mustard greens, winter radish, snow peas, yard-long beans, and varieties of melons, eggplant and cucumbers, among others. These vegetables are becoming more familiar to populations around the world as migration increases the popularity of ethnic foods. 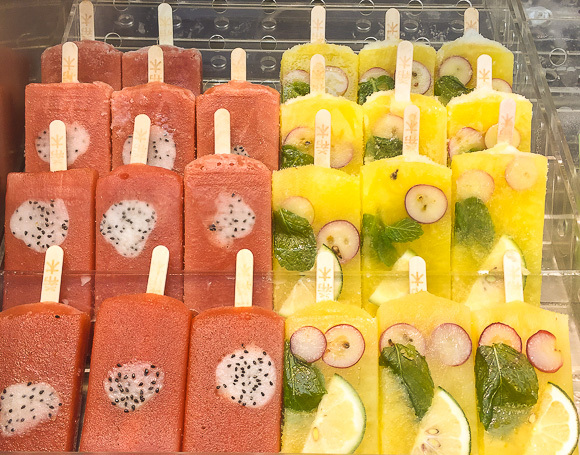 Cleverly made and decorated popsicles allowed me to taste China with Viking River at every stop. Lemon, radish, lime and mint flavors sat next to pomegranate and dragon fruit. The combinations were endless and inspired me to make notes for summer cookout desserts and big cocktail ice cubes back home. 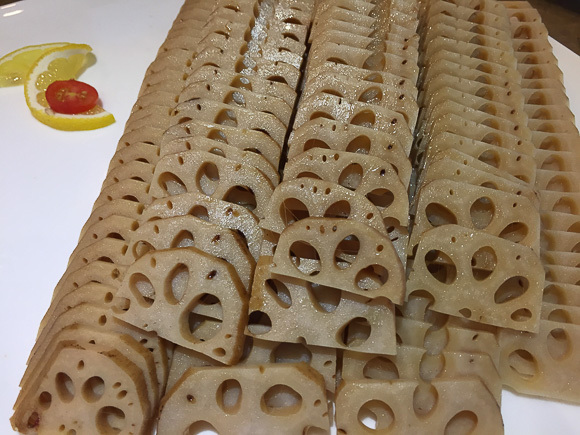 I was thrilled to see the lotus root available daily on board the cruise part of the trip. Crunchy with a delicate flavor, I love adding it to just about any meal. The part above is actually the stem of the plant which can grow upwards of four feet tall. The elegant flowers so revered in Buddhist and Hindu cultures crowns the top of the delicious stem. Called a cooling food, it is said to restore balance in the body. The fine threads of the stalk are used in a traditional Myanmar woven cloth that is treasured by anyone lucky enough to own one. My favorite however was the fresh fruit and coffee yogurt made every morning by chef Danny Tang onboard the Viking Emerald. It was the first thing I ate every day, and the pomegranate was divine. When I had the opportunity to sit down and have a chat, he shared the deliciousness came from a secret family recipe that he repeated every morning at 5am, I couldn’t get enough. Yum! 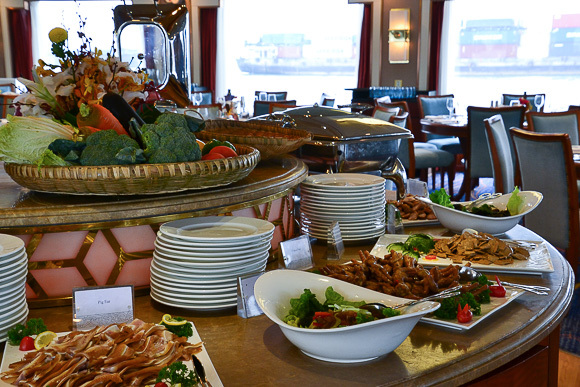 The cruise’s real highlight (apart from of course, the views of the Yangtze,) is the food. It’s reliable and high quality. Breakfast is a buffet affair, with both western and Chinese staples in good supply. Eggs can be cooked to order. Lunch and dinner are chosen from a set menu, with three courses each and an average of four choices for each course, again always with western and Chinese dishes available. A center buffet is always filled with additional options and salads. 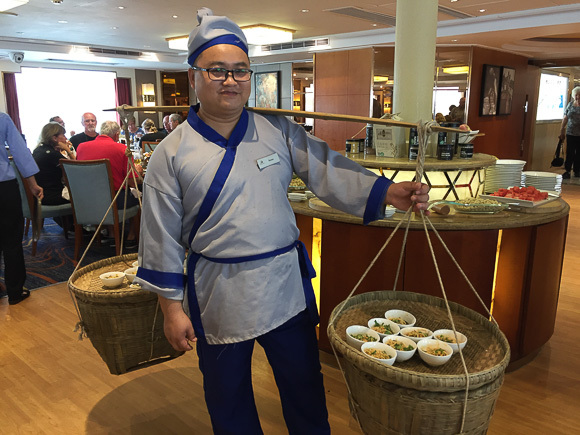 Some of the meals aboard are also themed, such as the ‘Chinese Banquet’ evening, which involved all the staff in traditional local dress. 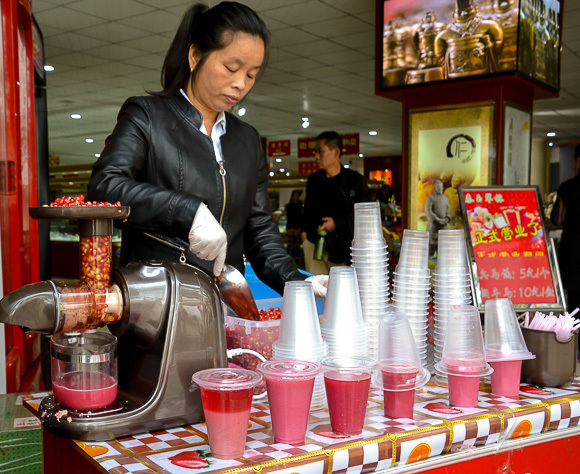 serving up an extensive assortment of meals, snacks and drinks from around China. 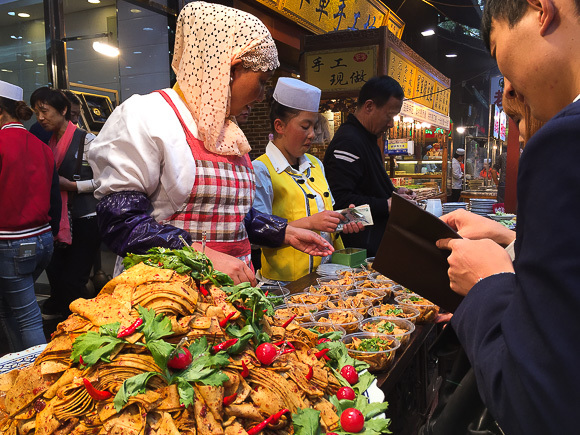 You’ll have the opportunity to try all the local exotic delicacies you’ve seen in the market: pig’s ears, chicken feet, and 100 year old eggs, to name a few, along with familiar Chinese dishes that don’t need a strong stomach. Let me finish by telling you that the less adventurous eater will find plenty of satisfying food along every step of the journey. American favorites were always available. 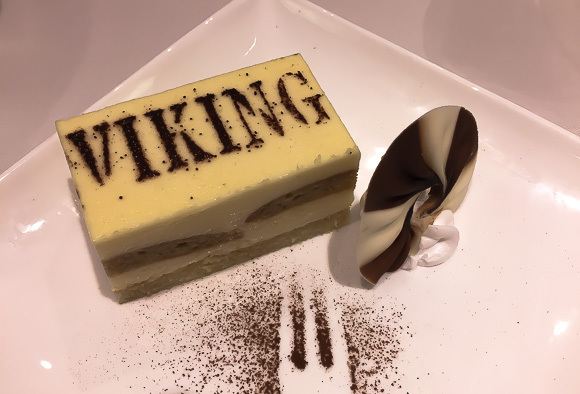 On our cruise, most of the guests were from the US and Canada, but when the % changes, Chef explained that Viking caters the menu to feature native dishes from whatever country of origin makes up the highest population on board. Just as I never had a problem finding a substitute for meat, taste buds will find familiar dishes and comfort food on the menus and at the hotels before boarding the ship. 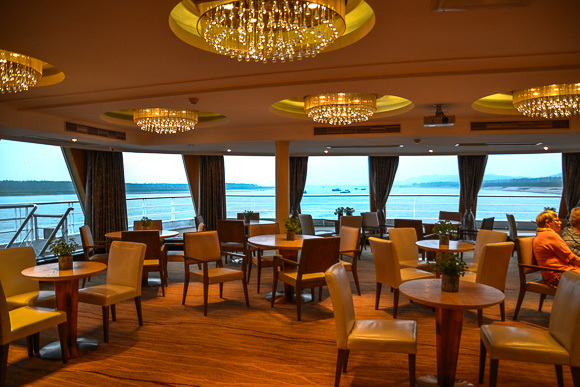 Which river cruise is the right choice for you? 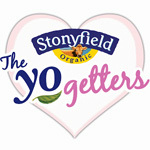 Why it’s all a matter of good taste of course! 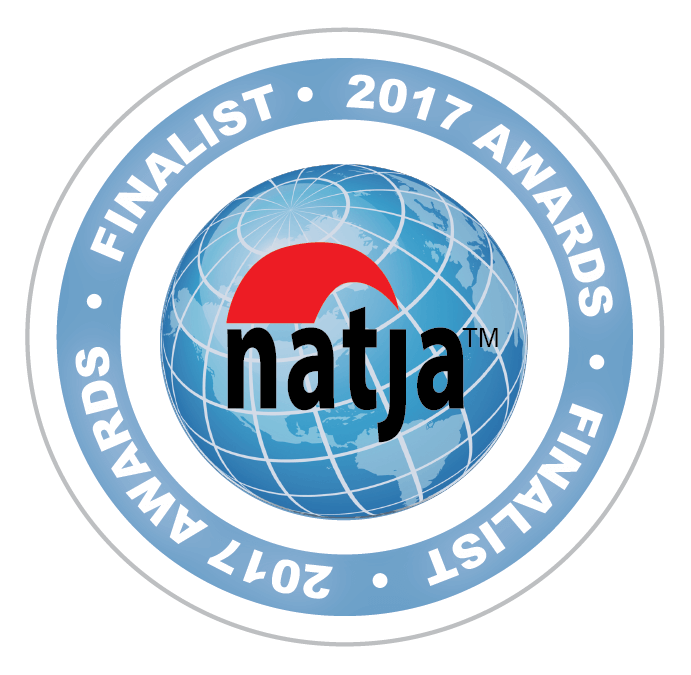 After taking my second journey with Viking, I understand why the company is such an award winning brand. From regional specialties to tasty American classics, your flavor palate will be taking a luxury journey right along side your body and mind. 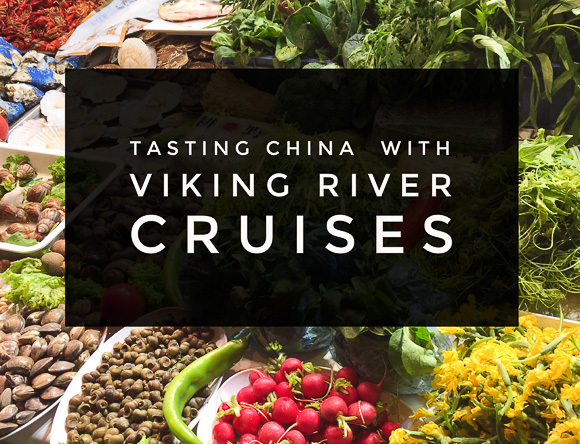 Disclaimer: The author was the honored guest of Viking River for their Imperial Jewels of China cruise. As always opinions are 100% my own. I am ready to get on this boat right now. I have never really wanted to cruise because I always like to be among the locals. It looks like this cruise encourages you to relate to the locals. This is now on my list of things to do. Hi Carol-because we were in port every day, there was plenty of time to walk and talk (or sign language) with local residents. An added perl-They loved having their picture taken with me, so I felt at times like a movie star! Oh dear. Now I’m starving for Chinese food. 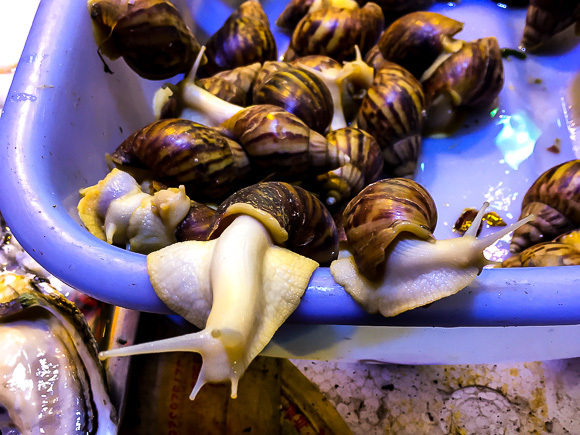 The snails were a little off putting, but you didn’t share any chicken feet photos, just the mouth watering (for Westerners) stuff. A river cruise seems like it would be a stress free way to visit China. Not being a meat eater, I avoided the chicken feet Suzanne, but almost everything I did try was delicious. Highly recommend the river cruise for this area of the world. As stress free as it can get for China. That would be just like the crew. They were so accommodating and kind. Thanks for stopping by and taking the time to comment Jane. What beautiful insight and historical reference you show. 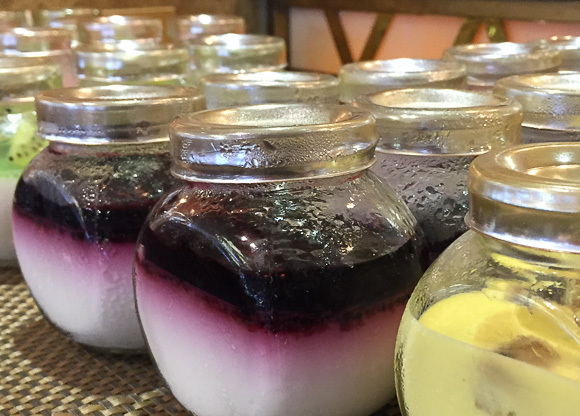 You dove into the culinary culture of China much further than most visitors would do. 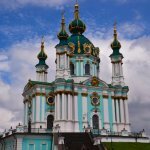 Viking River Cruises does a superior job–and you did, too. I love everything about this post!! I found the fact that parts of the great wall are held together by congee fascinating! I enjoy Chinese food but can’t say I know that much about it so this was a really interested read – such a diverse range of dishes and some delicious ingredients. You’ve made me hungry though! 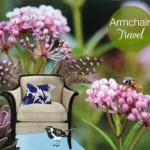 So many wonderful things to tempt you! And that private market tour sounds superb. What a treat. I WILL get there one day. A Viking River cruise in China sounds amazing. I love to explore a destination by its food too and it looks as though you had no end of Chinese culinary adventures. 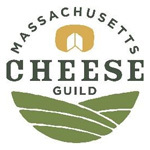 The market tour sounds especially appealing. 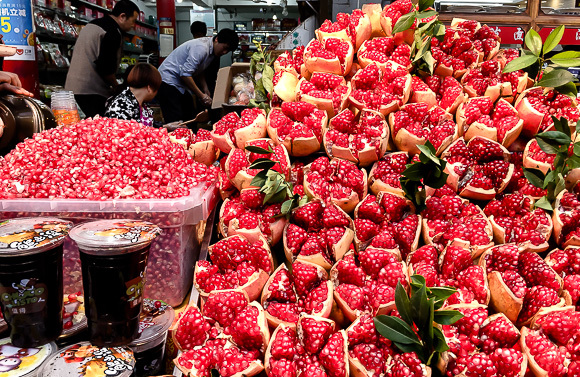 This is fascinating, look at those pomegranates… I had to zip past the snails! 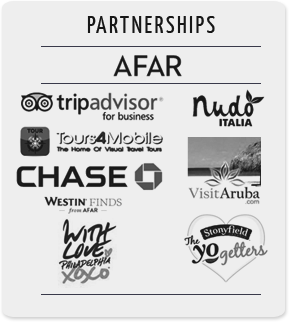 My skin crawls when people go somewhere and eat in the big names that might be found in New York, or based on Michelin stars… Why travel if not to do as you’ve shared! Alison, you’re DANGEROUS to read (in a nice way), because all I’m thinking now is ‘foooooood’!! My own mother always said that I ‘ate with my eyes’ too! But really, you make the food come alive as you describe its origins and uses. Fabulous! 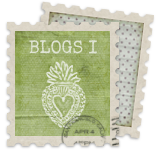 What a wonderful post Alison! I’m ready to book a voyage to China with Viking River cruises today. They always do such a wonderful job with every last detail. I’ve always been scared of China because of the food. I love travel but I am quite careful of what I eat and the cuisine worried me but what I have seen here has really changed my perceptions. I also had no idea about 5 Spice, I love Chinese 5 Spice and use it all the time, so I have really learned something! This sounds like an absolutely wonderful Viking Cruise! So nice that you got such a local “flavor” to boot! One of the great things about their itineraries are all the options. So many great included experiences and plenty of time to explore on your own should you choose.